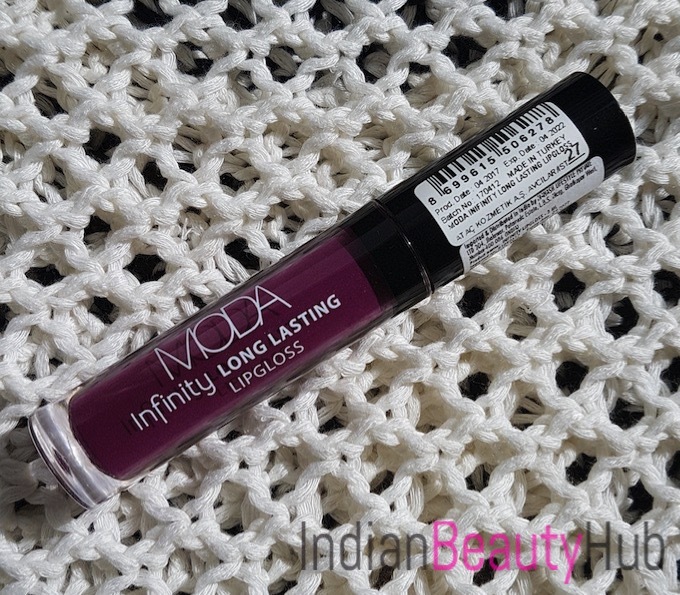 Hello everyone, today I am sharing the review of the MODA Infinity Long Lasting lip gloss in the shade no.27. This lip gloss is available in different shades of reds, purples and browns. 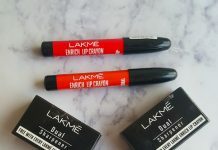 The price of the lip gloss is Rs.450 for 3ml and it can be bought online from Purplle.com. Packaging: The lip gloss comes in a color coded tube which helps in the easy identification of the lip color. 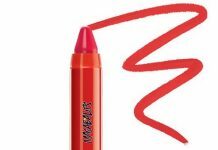 The cap comes with a good quality brush applicator that picks enough color for one application so that you will not have to frequently dip the wand in the tube. A sticker carrying shade name and other details is attached to the cap. Texture & Fragrance: The lip gloss has a creamy consistency which is neither too thick nor runny. It spreads smoothly on the lips without tugging. It does has a typical lipstick scent, which is not very strong though. Shade & Pigmentation: The shade no.27 is a pretty purple color with dark undertones. It comes with a good pigmentation however, you will need 2-3 coats for opaque finish. Performance: It dries quite fast and sets into matte finish. It stays on the lips for good 5-6 hours and then starts fading and smearing. It is quite lightweight and doesn’t give uncomfortable sticky feeling. Another plus point of this lip gloss is that it doesn’t transfer on cup/glass or other surfaces. This shade will look good on all skin complexions and is ideal to wear during the fall or winter season. The design of the applicator brush helps in precise and smooth application of the lip color. It is a pretty purple color that will look good on all skin complexions. It stays on the lips quite long (5-6 hours). It gives a good color pay-off with just 2-3 swipes. Dries fast and sets into matte finish. Available in beautiful shades of reds, berries and browns. It can be easily removed with coconut oil or vaseline. Sometimes it gives uneven finish on the lips. 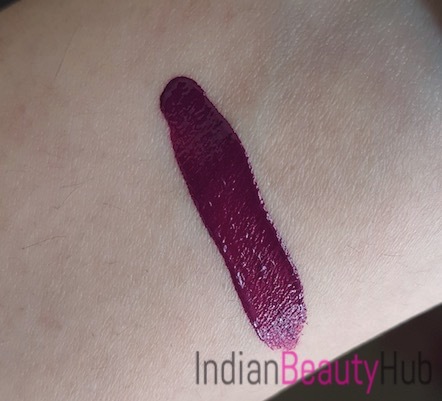 It is a quite bold shade and some ladies might not feel comfortable wearing it. 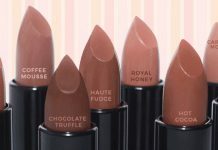 The formula is not very moisturizing and lips feel a little dry after some time, especially during the colder weather. Completely avoid it if you have dry or flaky lips (it will accentuate the dry patches on the lips). 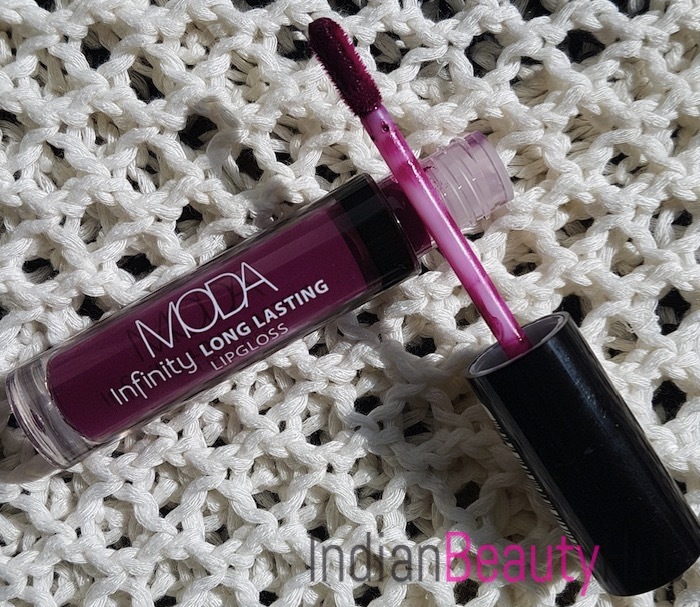 Overall, it is worth trying at least one shade from MODA Infinity Long Lasting lip gloss. 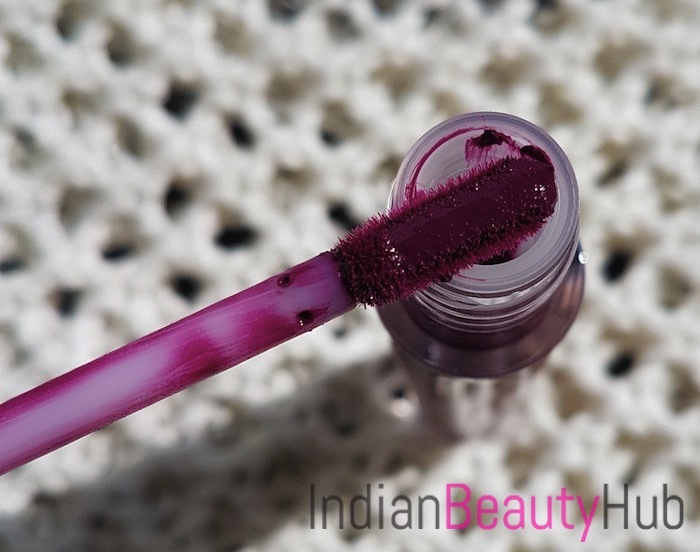 It has creamy texture, good pigmentation, matte finish and stays put for long.